Sweepstakes Advantage has their April Sweepstakes Giveaway up! 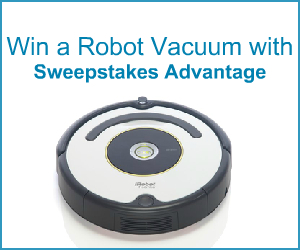 You can enter to win a Robot Vacuum! Simply click on the picture below and then log in or join their page (you'll find lots of sweepstakes there too! It's one of my favorites to find ending today things!) and then it will take you to the form to enter the giveaway! Good Luck!